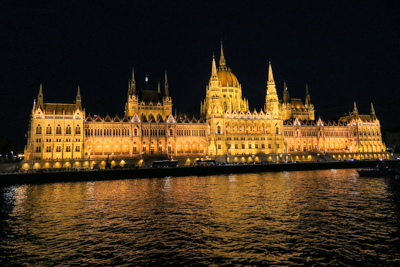 ABOARD THE VIKING VILHJALM — Budapest has well earned its nickname of the “ Pearl of the Danube.” The Danube River waltzes through the city core, dividing the old city on the west – – Buda – – and its younger sibling – – Pest – – on the opposite bank. Viking justly named its river cruise the Danube Waltz, accentuating the river’s music with a daily complimentary tour and a variety of optional excursions. I started with the free driving tour around the flat banks of the Pest side. It showcases grand architecture and monuments of more modern times, both splendid and tumultuous. The Buda side climbs to heights to explore castles, churches and historic palaces from much earlier times. While I’d have enjoyed a dip in the famous thermal baths and a visit to the Grand Market, there is only so much time. This whirlwind day mimicked the exhilaratingly fast Hungarian dance called the Czardas; a more graceful, slow tune would have better served. However, even a single day in Budapest is grand, and the panoramic bus tour revived history class memories of the Austro-Hungarian Empire. We scooted down tree-lined Andrassy Avenue, built to resemble the Champs Elysees, past Hero’s Square, and over the Elizabeth Bridge. Dropped off at the top of Castle Hill, we learned that Buda Castle dates back to the 13th century. However, post-WWII reconstruction changed its appearance, I’m afraid not for the better. The castle terrace offers panoramic vistas but a rather uninspiring changing of the guard ceremony. The 700-year-old Mathias Church offered a lure for eye and soul, with its Gothic exterior and flamboyant steeple topped by the symbolic Matthias raven with a ring. Colorful patterns of Zsolnay ceramic tiles paint the roof brilliantly in an entrancing pattern. The moment you step through the massive doors, an astonishing swath of swirling hues and stenciled designs offer a welcoming embrace. The heavily adorned church served the Hapsburg kings as a coronation site for centuries including the last two. Nearby, the Fisherman’s Bastion commands the steep descent to the river with its seven-level wedding cake-like construction of inter-connecting white stucco towers. Its terraces provide an overview of the river and, on the other side, Parliament. The most impressive building in the capital, this imposing and beautiful behemoth started construction in 1885 – – completed in 1904. About one thousand people used 40 million bricks and half a million precious stones to bring the Parliament to its impressive height and breadth. During the communist regime a red star perched on the top of the dome – – it came down joyously in 1990. Hungarian independence rang from the balcony on October 23, 1989. Today the Republic of Hungary uses only a small portion of the building. The ride back to the Viking Longship passed 50 pairs of bronze shoes along the riverside. 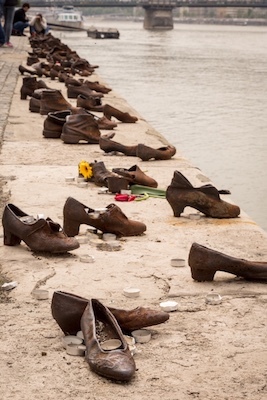 The gripping memorial reminds of the Jews shot along the banks in 1944 so that their bodies would fall in the Danube. An afternoon excursion to the Jewish Ghetto was offered and is itself a memorable stop, but I’d visited on a previous trip. An afternoon jaunt to a Hungarian Horse Show grabbed my attention when perusing Vikings impressive pre-cruise materials. We bussed to Domonyvölgy about 40 minutes outside of the city. At Lázár Equestrian Park, we were greeted with pálinka, a Hungarian fruit brandy dating to the 14th century. It was very strong, and not much to my liking. 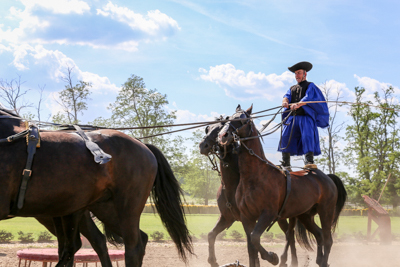 The horse show followed an announcer touting the centuries-old traditions of Hungarian horseback riding which form the stuff of military legend. An archer galloping by hit his bulls-eye seemingly without effort. Other riders gave commands to their four-legged friends to lie down — while they were still mounted. A team of horses pulling carts zipped across, and one female equestrian impersonated Sisi, the Hungarian Empress known for her advanced riding skills. The costumed girl rode sidesaddle, directing her mount to tip-toe, dance and turn circles. Another man performed trick riding with a team of five Hungarian Nonius horses, three in the front and two in the rear. He stood, straddling the rear horses with one foot on each. Pretty thrilling! Four of the most enormous oxen I have ever seen pulled a cart slowly around the track. The announcer had to explain that they were moving at their top speed, somewhat humorous compared to the previous stallions. After the show, the group took a jostling horse-drawn carriage ride around the park, meeting Hungarian farm animals—long-woolen Racka sheep, a Mangalica pig, and some Puli dogs. We also toured the stables and the over-endowed trophy room of the Lazar Brothers. The famous siblings have earned 16 world championship titles in horse-carriage racing. A brief video gave an up-close look at the magic of their skills. The unforgettable highlight of Budapest came (as it does for what seems like everyone in Budapest) at day’s end. A twilight cruise drifted slowly past the illuminated monuments further up the Danube. Then came a turn-around and final pass by the gobsmacking, golden glow of Parliament at night. You could take this ride forever and not tire of the splendor.